This article is about writing music. For management of computing resources, see Orchestration (computing). For orchestrating a pervasive game, see Orchestration (games). A hand-written musical score for Act 2 of the opera Der Freischütz by Carl Maria von Weber, written in the 1820s. The score contains all the parts for the singers and the accompaniment parts and melodies for the orchestra. 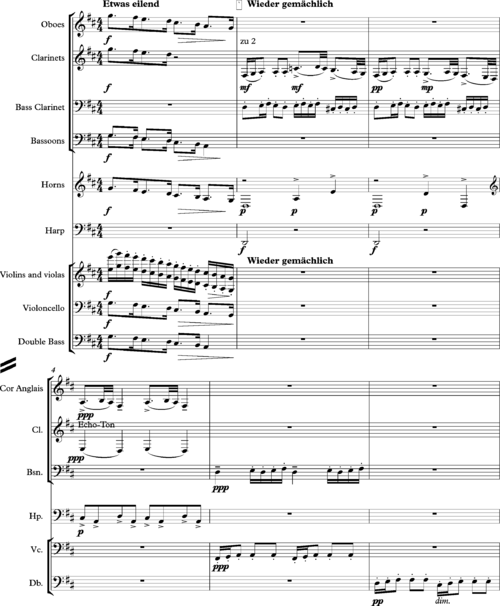 Orchestration is the study or practice of writing music for an orchestra (or, more loosely, for any musical ensemble, such as a concert band) or of adapting music composed for another medium for an orchestra. Also called "instrumentation", orchestration is the selection of different instruments to play the different parts (e.g., melody, bassline, etc.) of a musical work. For example, a work for solo piano could be adapted and orchestrated so that an orchestra could perform the piece. Only gradually over the course of music history did orchestration come to be regarded as a separate compositional art in itself. In classical music, most composers write the melodies, chord progression and musical form for a piece and, then, if they want the piece to be played by an orchestra, they orchestrate the piece themselves. In musical theatre, however, the composer typically writes the melodies and then hires a professional arranger or orchestrator to devise the parts for the pit orchestra to play. An orchestrator is a trained musical professional who assigns instruments from an orchestra or other musical ensemble to a piece of music written by a composer, or who adapts music composed for another medium for an orchestra. Orchestrators may work for musical theatre productions, film production companies or recording studios. Some orchestrators teach at colleges, conservatories or universities. The term orchestration in its specific sense refers to the way instruments are used to portray any musical aspect such as melody, harmony or rhythm. For example, a C major chord is made up of the notes C, E, and G. If the notes are held out the entire duration of a measure, the composer or orchestrator will have to decide what instrument(s) play this chord and in what register. Some instruments, including woodwinds and brass are monophonic and can only play one note of the chord at a time. However, in a full orchestra there are more than one of these instruments, so the composer may choose to outline the chord in its basic form with a group of clarinets or trumpets (with separate instruments each being given one of the three notes of the chord). Other instruments, including the strings, piano, harp, and pitched percussion are polyphonic and may play more than one note at a time. As such, if the composer/orchestrator wishes to have the strings play the C major chord, she could assign the low C to the cellos and basses, the G to the violas, and then a high E to the second violins and an E an octave higher to the first violins. If the composer/orchestrator wishes the chord to be played only by the first and second violins, she could give the second violins a low C and give the first violins a double stop of the notes G (an open string) and E.
Additionally in orchestration, notes may be placed into another register (such as transposed down for the basses), doubled (both in the same and different octaves), and altered with various levels of dynamics. The choice of instruments, registers, and dynamics affect the overall tone color. If the C major chord was orchestrated for the trumpets and trombones playing fortissimo in their upper registers, it would sound very bright; but if the same chord was orchestrated for the celli and string basses playing sul tasto, doubled by the bassoons and bass clarinet, it might sound heavy and dark. Note that although the above example discussed orchestrating a chord, a melody or even a single note may be orchestrated in this fashion. Also note that in this specific sense of the word, orchestration is not necessarily limited to an orchestra, as a composer may orchestrate this same C major chord for, say, a woodwind quintet. A melody is also orchestrated. The composer or orchestrator has to decide which instrument (or instruments) will play the melody. The melody can be ably played by the first violins. As well, the woodwinds and brass instruments can effectively carry a melody, depending on the effect the composer/orchestrator desires. The trumpets can perform a melody a powerful, high register. Alternatively, if the trombones play a melody, the pitch will be lower than the trumpet, and the tone will be heavier, which may change the musical effect that is created. While the cellos are often given an accompaniment role in orchestration, there are notable cases where the cellos have been assigned the melody. 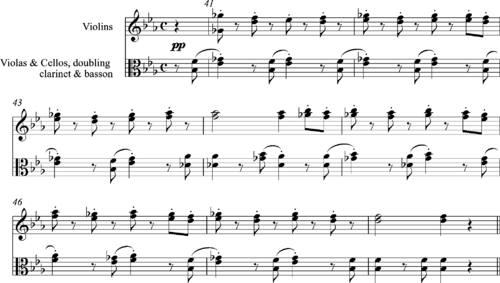 In even more rare cases, the double bass section may be given a melody (e.g., the high-register double bass solo in Prokofievs Lieutenant Kije Suite). While assigning a melody to a particular section, such as the string section or the woodwinds will work well, as the instruments all blend together well, some composers give the melody to one section and then have the melody doubled by a different section or an instrument from a different section. For example, a melody played by the first violins could be doubled by the glockenspiel, which would add a sparkling, chime-like colour to the melody. Alternatively, a melody played by the piccolos could be doubled by the celesta, which would add a bright tone to the sound. In the 20th and 21st century, contemporary composers began to incorporate electric and electronic instruments into the orchestra, such as the electric guitar played through a guitar amplifier, the electric bass played through a bass amplifier, the Theremin and the synthesizer. The addition of these new instruments gave composers new options for creating tonal "colours" in their orchestration. For example, in the late 20th century and onwards, a composer could have a melody played by the first violins doubled by a futuristic-sounding synthesizer to create an unusual effect. Orchestral instrumentation is denoted by an abbreviated formulaic convention, as follows: flute, oboe, clarinet, bassoon- horn, trumpet, trombone, tuba. More details can be contained in brackets. A dot separates one player from another, a slash indicates doubling. Timpani and percussion are denoted 2Tmp+ number of percussion. As an example, Mahler Symphony 2 is scored: 4[1/pic.2/pic.3/pic.4/pic] 4[1.2.3/Eh.4/Eh] 5[1.2.3/bcl.4/Ebcl2.Ebcl] 4[1.2.3.4/cbn]- 10 8 4 1- 2tmp+4-2 hp- org- str. During the Baroque era, composers showed increasing awareness of the expressive potential of orchestration. The orchestral accompaniment to the aria 'et misericordia' from J.S.Bach’s Magnificat, BWV243 (1723) features muted strings doubled by flutes, a subtle combination of mellow instrumental timbres. In a more general sense, orchestration also refers to the re-adaptation of existing music into another medium, particularly a full or reduced orchestra. 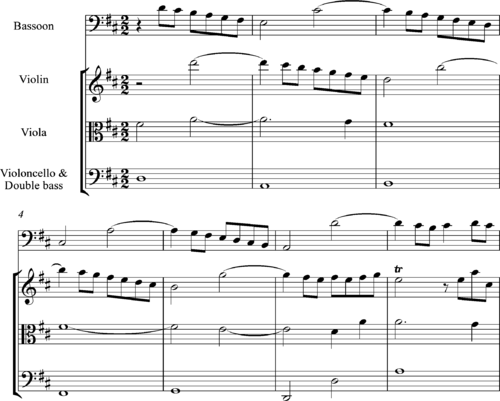 There are two general kinds of adaptation: transcription, which closely follows the original piece, and arrangement, which tends to change significant aspects of the original piece. In terms of adaptation, orchestration applies, strictly speaking, only to writing for orchestra, whereas the term instrumentation applies to instruments used in the texture of the piece. In the study of orchestration – in contradistinction to the practice – the term instrumentation may also refer to consideration of the defining characteristics of individual instruments rather than to the art of combining instruments. In commercial music, especially musical theatre and film music, independent orchestrators are often used because it is difficult to meet tight deadlines when the same person is required both to compose and to orchestrate. Frequently, when a stage musical is adapted to film, such as Camelot or Fiddler on the Roof, the orchestrations for the film version are notably different from the stage ones. In other cases, such as Evita, they are not, and are simply expanded versions from those used in the stage production. Most orchestrators often work from a draft (sketch), or short score, that is, a score written on limited number of independent musical staves. Some orchestrators, particularly those writing for the opera or music theatres, prefer to work from a piano vocal score up, since the singers need to start rehearsing a piece long before the whole work is fully completed. That was, for instance, the method of composition of Jules Massenet. In other instances, simple cooperation between various creators is utilized, as when Jonathan Tunick orchestrates Stephen Sondheim's songs, or when orchestration is done from a lead sheet (a simplified music notation for a song which includes just the melody and the chord progression). In the latter case, arranging as well as orchestration will be involved. Due to the enormous time constraints of film scoring schedules, most film composers employ orchestrators rather than doing the work themselves, although these orchestrators work under the close supervision of the composer. Some film composers have made the time to orchestrate their own music, including Bernard Herrmann (1911-1975), Georges Delerue (1925-1992), Ennio Morricone (1928-), John Williams (1932-) (his very detailed sketches are 99% orchestrated), Howard Shore (1946-), James Horner (1953-2015) (on Braveheart), Bruno Coulais (1954-), Rachel Portman (1960-), Philippe Rombi (1968-) and Abel Korzeniowski (1972-). Although there have been hundreds of orchestrators in film over the years, the most prominent film orchestrators for the latter half of the 20th century were Jack Hayes, Herbert W. Spencer, Edward Powell (who worked almost exclusively with Alfred Newman), Arthur Morton, Greig McRitchie, and Alexander Courage. Some of the most in-demand orchestrators today (and of the past 30 years) include Jeff Atmajian, Pete Anthony, Brad Dechter (James Newton Howard, Christopher Young, Theodore Shapiro, Teddy Castellucci, Danny Elfman, John Powell, Marco Beltrami, John Debney, Marc Shaiman, Michael Giacchino), Conrad Pope (John Williams, Alexandre Desplat, Jerry Goldsmith, James Newton Howard, Alan Silvestri, James Horner, Mark Isham, John Powell, Michael Convertino, Danny Elfman, Howard Shore), Eddie Karam (John Williams, James Horner), Bruce Fowler (Hans Zimmer, Klaus Badelt, Harry Gregson-Williams, Steve Jablonsky, Mark Mothersbaugh, John Powell), John Ashton Thomas (John Powell, John Debney, Alan Silvestri, James Newton Howard, Henry Jackman, Lyle Workman, Theodore Shapiro, John Ottman, John Paesano), Robert Elhai (Elliot Goldenthal, Michael Kamen, Ed Shearmur, Brian Tyler, Klaus Badelt, Ilan Eshkeri ) and J.A.C. Redford (James Horner, Thomas Newman). Conrad Salinger was the most prominent orchestrator of MGM musicals from the 1940s to 1962, orchestrating such famous films as Singin' in the Rain, An American in Paris, and Gigi. In the 1950s, film composer John Williams frequently spent time with Salinger informally learning the craft of orchestration. Robert Russell Bennett (George Gershwin, Rodgers and Hammerstein) was one of America's most prolific orchestrators (particularly of Broadway shows) of the 20th century, sometimes scoring over 80 pages a day. Most films require 30 to 120 minutes of musical score. Each individual piece of music in a film is called a "cue". There are roughly 20-80 cues per film. A dramatic film may require slow and sparse music while an action film may require 80 cues of highly active music. Each cue can range in length from five seconds to more than ten minutes as needed per scene in the film. 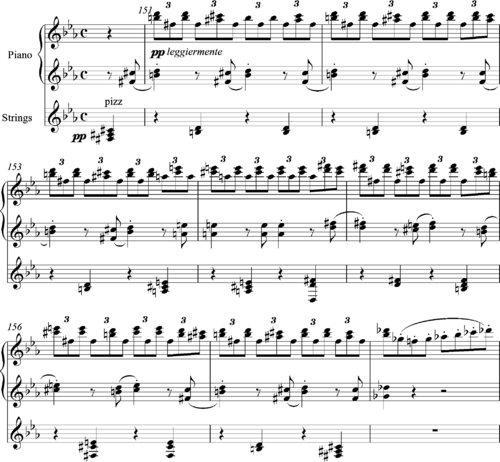 After the composer is finished composing the cue, this sketch score is delivered to the orchestrator either as hand written or computer generated. Most composers in Hollywood today compose their music using sequencing software (e.g. Digital Performer, Logic Pro, or Cubase). 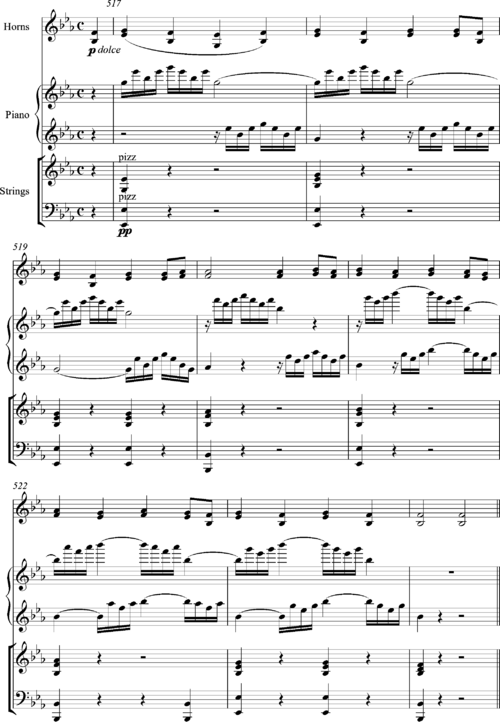 A sketch score can be generated through the use of a MIDI file which is then imported into a music notation program such as Finale or Sibelius. Thus begins the job of the orchestrator. Every composer works differently and the orchestrator's job is to understand what is required from one composer to the next. If the music is created with sequencing software then the orchestrator is given a MIDI sketch score and a synthesized recording of the cue. The sketch score only contains the musical notes (e.g. eighth notes, quarter notes, etc.) with no phrasing, articulations, or dynamics. The orchestrator studies this synthesized "mockup" recording listening to dynamics and phrasing (just as the composer has played them in). He or she then accurately tries to represent these elements in the orchestra. However some voicings on a synthesizer (synthestration) will not work in the same way when orchestrated for the live orchestra. The sound samples are often doubled up very prominently and thickly with other sounds in order to get the music to "speak" louder. The orchestrator sometimes changes these synth voicings to traditional orchestral voicings in order to make the music flow better. He or she may move intervals up or down the octave (or omit them entirely), double certain passages with other instruments in the orchestra, add percussion instruments to provide colour, and add Italian performance marks (e.g. Allegro con brio, Adagio, ritardando, dolce, staccato, etc.). 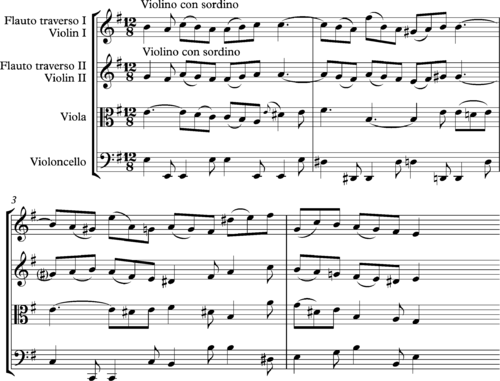 If a composer writes a large action cue, and no woodwinds are used, the orchestrator will often add woodwinds by doubling the brass music up an octave. The orchestra size is determined from the music budget of the film. The orchestrator is told in advance the number of instruments he or she has to work with and has to abide by what is available. Sometimes a composer will write a three-part chord for three flutes, although only two flutes have been hired. The orchestrator decides on where to put the third note. After the orchestrated cue is complete it is delivered to the copying house (generally by placing on a server) so that each instrument of the orchestra can be extracted, printed, and delivered to the scoring stage. The major film composers in Hollywood each have a lead orchestrator. Generally the lead orchestrator attempts to orchestrate as much of the music as possible if time allows. If the schedule is too demanding, a team of orchestrators (ranging from two to eight) will work on a film. The lead orchestrator decides on the assignment of cues to other orchestrators on the team. Most films can be orchestrated in one to two weeks with a team of five orchestrators. New orchestrators trying to obtain work will often approach a film composer asking to be hired. They are generally referred to the lead orchestrator for consideration. At the scoring stage the orchestrator will often assist the composer in the recording booth giving suggestions on how to improve the performance, the music, or the recording. If the composer is conducting, sometimes the orchestrator will remain in the recording booth to assist as a producer. Sometimes the roles are reversed with the orchestrator conducting and the composer producing from the booth. Michael Praetorius (1619): Syntagma musicum volume two, De Organographia. Hector Berlioz (1844), revised in 1905 by Richard Strauss: Grand traité d’instrumentation et d’orchestration modernes (Treatise on Instrumentation). François-Auguste Gevaert (1863): Traité general d’instrumentation. Charles-Marie Widor (1904) : Technique de l’orchestre moderne (Manual of Practical Instrumentation). Nikolay Rimsky-Korsakov (1912): Основы оркестровки (Principles of Orchestration). Alfredo Casella: (1950) La Tecnica dell'Orchestra Contemporanea. Kent Kennan: (1952) The Technique of Orchestration. Charles Koechlin (1954–9): Traité de l'Orchestration (4 vols). Stephen Douglas Burton (1982): Orchestration. Samuel Adler (1982, 1989, 2002): The Study of Orchestration. Alfred Blatter (1997) : Instrumentation and Orchestration (Second edition). ↑ Daniels, David (2005). Orchestral Music a Handbook. Scarecrow Press Inc.
↑ Pincherle, M. (1967, p.122) An Illustrated History of Music. London, MacMillan. ↑ Fiske, R. (1970), Beethoven Concertos and Overtures. London, BBC. ↑ Fiske, R. (1970, p.41), Beethoven Concertos and Overtures. London, BBC. ↑ Fiske, R. (1970, p.42), Beethoven Concertos and Overtures. London, BBC. ↑ Austin, W. (1966, p. 123) Music in the 20th Century. London, Dent. ↑ Adorno, T.W. (1971, p.53) Mahler, a musical physiognomy. Trans. Jephcott. University of Chicago Press. ↑ Piston, W. (1969) Orchestration. London, Victor Gollancz. The Orchestra: A User's Manual by Andrew Hugill with The Philharmonia Orchestra. In depth information on orchestration including examples and video interviews with instrumentalists of each instrument.